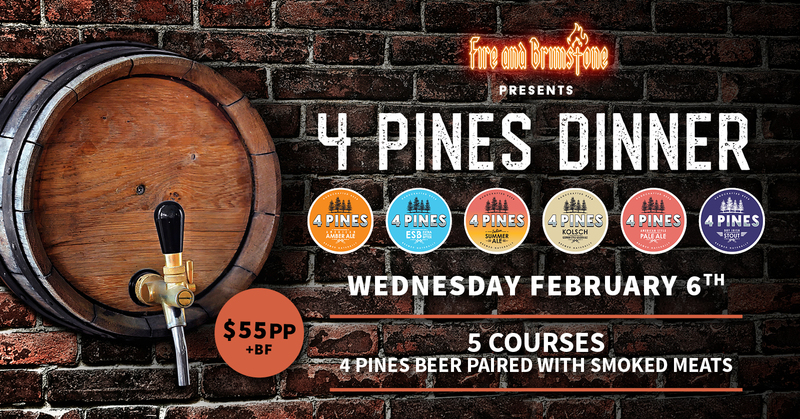 Join us at Fire and Brimstone BBQ on Wednesday February 6th for a 4 Pines Beer Tasting Dinner paired with low n slow smoked barbeque meats! You will be taken on a journey with a Beer Pro, Nathan from 4 Pines and learn the behind the scenes of the delicious craft beers. Our Pitmaster at Fire and Brimstone BBQ - Brad Shorten - has paired with a variety his smoked meats with each beer to ensure that the taste is just right! Event begins at 6:30pm - Tickets are $55pp - Spaces are limited - don't miss out!